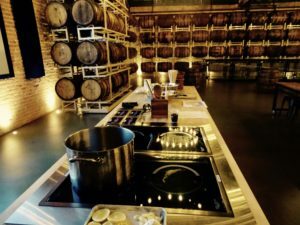 We are at the Goose Island Barrel House, an amazing event space with a stunningly beautiful interior with a long bar and medieval style chambers. 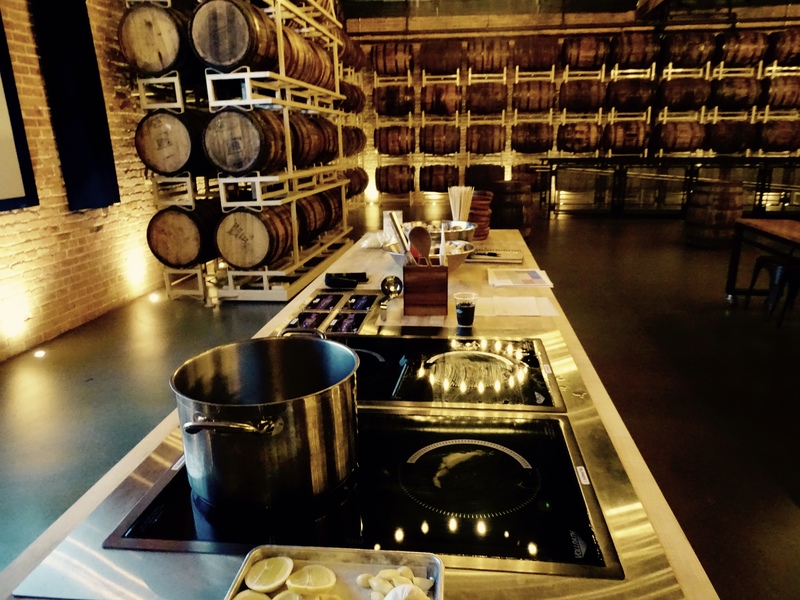 There is a small demo kitchen in front of the rows of long wooden tables in the main room. I can’t help but eye the walls lined with rustic, wooden barrels. At the back, guests are busy helping themselves to cheese and free Goose Island beer. 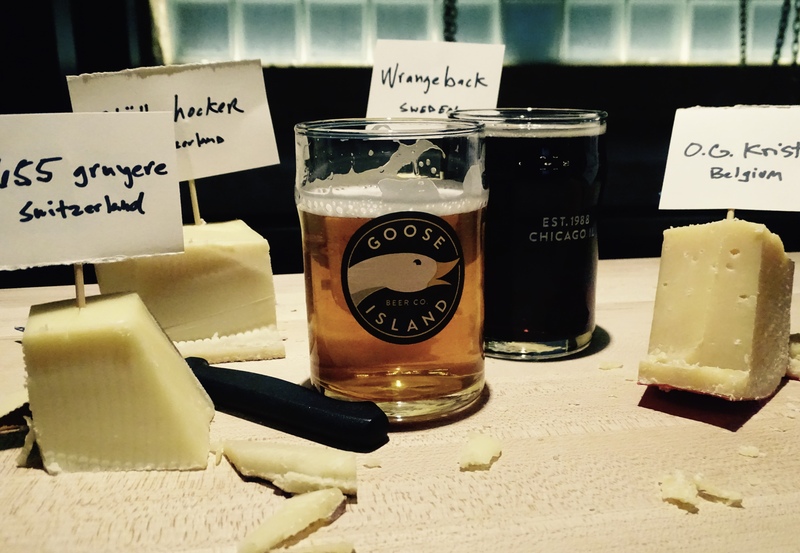 For some, cheese and wine may seem a more fitting pair, but beer is also an excellent accompaniment. Like crackers or bread, beer is also is made of grains and has a yeasty note and a slight fizz that complements cheese brilliantly. I fill my plate of cheeses from Switzerland, Sweden, Spain and Belgium and choose a light, but slightly hoppy Sofie pilsner-style brew at the bar in the back and settle down in my seat, ready to hear the lecture. 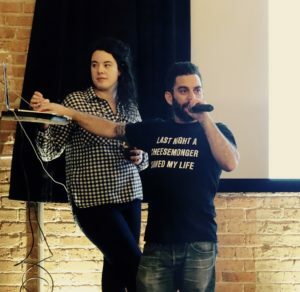 Most Chicagoans won’t probably know him, but Adam Moskowitz is cheese-crazed lunatic and industry expert who has been in the business for his whole life. He’s a self-described turophile, a connoisseur of cheese and naturally is “most happy when (he) eats cheese.” His Barnyard Collective, located at the Larkin Cold Storage in Long Island City, Queens, regularly hosts cheese talks and tastings with some of the East Coast and Europe’s most innovative artisanal cheesemakers such as Mateo Kehler of Jasper Hill and Cultivo Creamery who share their knowledge with the cheese community. “If you’re a cheesemonger, you are a shaman.” Adam begins. Much of lecture covers the basics: the four kinds of cheese: sheep, cow, goat and water buffalo, the three types of production: industrial, artisanal and farmstead – and a bizarre amount diagrams and geeky memes. After a long while rambling on the history of cheese, the four main ingredients and how cool it is to work with cheese, he suddenly says, “(Cheesemongers) help people connect to good memories.” He’s right. The collaboration between the Barnyard and Goose Island itself was a beautiful mariage of refreshing beer and creamy, sinful indulgence. This is a memory in the making. The O.G. 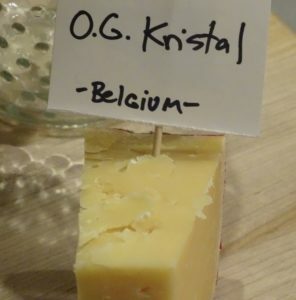 Kristal aged-gouda style from Belgium on my plate is a winner with a beautiful finish and textures of salt crystals and melty cheesy flavor that goes perfectly with a glass of Sofie. This is comfort food at its best. My seatmate has opted for the Goose Island dark colored Parker Porter whose caramel and burnt sugar aromas make a wonderful match with the sheep’s milk. And finally, the other crowd pleaser is the Belgian Trappiste style pale ale Matilda. Its radiant, golden color and slightly hoppy, bitter note would be nice foil to a washed-rind cheese like Grayson or a French Muenster. 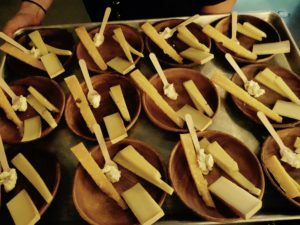 There were more pairings of cheese and beer following the lecture organized by one of the other cheesemongers including a wonderful Cabot Clothbound Cheddar from Jasper Hill and a melt-on-your palette goat cheese that I washed down with my glass of Sofie. 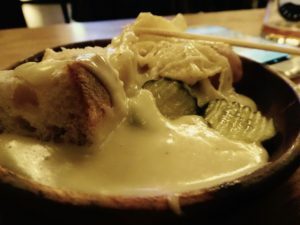 The finale was Adam’s molten, pungent cheese fondue which we greedily drizzled on our plates of roast potatoes, veggies, bread and pickles. We take our final sips, bites and exchange a bit of small talk as the evening concludes. If cheesemongers are puppeteers and cheese are the characters in a cheese shop theatre, as Adam put it, then the result is pure, perfect harmony. And tonight will be another nice memory. 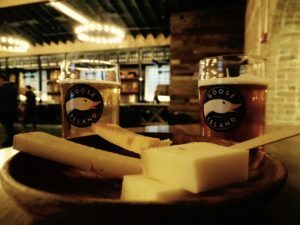 For upcoming beer events please visit Goose Island.